Immaculee is our most 'stubborn' peony. Some of her flowers get, apart from their white color, a pinkish glow. Because of her fantastic fragrance and sweet appearance, she is a keeper. 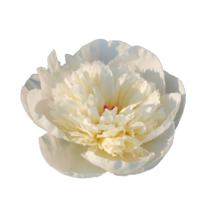 Immaculee is a special peony: she switches between double flowered and light filled. A strong-willed flower who can be hard to grow, but who is absolutely worth the effort. The flowers of this peony do not all share the same look. The color of the bud may differ: the flowers get either a white color or a pinkish glow. This is why this peony is unpredictable, but also surprising. Immaculee is a Dutch creation from 1953. After she had got perfected, Van der Valk and Van der Zwet registered her the same year. Since then, she has never left the scene. The same men also created other peonies like Catharina Fontijn.